In the first part I gave you an example of automating backup on windows 2003 server using batch files and scheduled tasks. In this second part, I will give another example on automating backup using the same technique but on windows 2008. 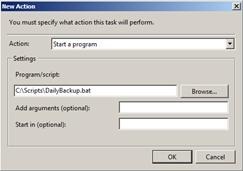 Windows 2008 already comes with a predefined template for scheduling backup using task scheduler but using this simple method will only have the option of backing up the whole disk (taking an image of the disk), but fortunately there is an ability to select what to backup using the wbadmincommand through the command prompt. You must run wbadminfrom an elevated command prompt. Click Start, right-click Command Prompt, and then click Run as administrator. Specify the volumes to be included in the backup, remember in windows 2008 you can only select the entire volume (C: D: …) but you cannot select individual files or folders. If you use 2008 R2 you can do so and I will explain it in Part 3. Make sure that you have created the three empty folders inside share1 (Today, Yesterday and Old) and rotate backup among them. Please refer to part 1 to understand why I used these three folders. This will execute the image backup of the selected drives. Remember as you must take backup of the entire volume and you can not select certain items, but you can restore individual files and folders or selected items. Each time you execute this batch file will delete the oldest backup and will rename today & yesterday’s back then create new backup in today’s folder. From the menu select Create Task. In the Triggers tab, click New, then Select the daily time to execute the task, make sure it is enabled. In most cases you will recover the system (restore the backup) from a connected media (volume) such as a hard Disk, DVD drive, USB drive and so on… Usually when recovering a system it rearly to restore a backup from a shared foler. Accordingly, your -backuptarget option will be a volume (e.g. -backuptarget:F:). In that case the backup folder ” WindowsImageBackup ” should be on the root of that volume. When berforming the backup and your backuptarget is a volume, then the backup program will format that volume and if there were old backups, they will be lost. That’s why the shared folder is used for backups in windows 2008. In the Part 3 I will explain some differences between 2008 & 2008 R2 in executing the wbadmin.